Egyptian unrest where three were killed on December 27, 2013. The military regime has outlawed the Muslim Brotherhood and imposed other restrictions on protests., a photo by Pan-African News Wire File Photos on Flickr. Nationwide clashes broke out on Friday between loyalists of deposed president Mohamed Morsi, local residents and security forces, leaving three dead. According to a statement issued by the interior ministry, the slain were killed in Cairo, Upper Egypt’s Menya and Damietta in the Nile Delta. The violence took place less than 48 hours after the cabinet declared the Muslim Brotherhood a terrorist group. An official source from the health ministry told Al-Ahram Arabic news website that at least 12 were injured in clashes in Cairo, Ismailia, Fayoum and Menya. Most of the injuries resulted from the use of birdshot. The deputy head of Menya’s security directorate was injured during the clashes, the interior ministry said. A member of the anti-Morsi Tamarod group, Raed Abdeen, was injured in Fayoum and accused a member of the Muslim Brotherhood of shooting at him, added the ministry. A total of 265 Muslim Brotherhood members were arrested, while three police vehicles were torched by pro-Morsi protesters across the country. The ministry had earlier announced the arrests included around 28 women. Earlier on Friday afternoon, Al-Azhar students hurled rocks at police who were deployed outside their hostel gates to prevent them protesting on the streets outside. 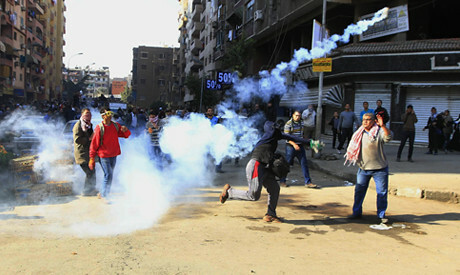 The security forces fired teargas to disperse the protesters. The students were protesting outside their hostels in solidarity with their colleague who was killed on Thursday. Mohamed Abdel-Latif, a first year agriculture student, died in clashes between pro-Morsi Al-Azhar students and local residents in Nasr City. Abdel-Latif was the second Al-Azhar student to be killed during clashes in the past three months. In Cairo's Zeitoun, security forces prevented protesters from marching to the Qoba presidential palace. While in Upper Egypt’s Luxor a pro-Morsi protest was dispersed by security forces using teargas. Protesters blocked a road in Giza's Haram before they were dispersed with tear gas. The interior ministry said four soldiers were hurt in fierce clashes with demonstrators in Giza. The demonstrations by Muslim Brotherhood supporters and loyalists in Alexandria, Sohag, Fayoum, Bani Souef, Damietta, Behaira and Port Said and other areas came in response to calls by the Brotherhood-led National Alliance to Support Legitimacy. On Wednesday, the interim government officially designated the Muslim Brotherhood a terrorist organisation. On Thursday, an interior ministry spokesperson announced a five-year penalty for participating in a protest organised by the Islamist group.